Pets Costs > How Much Does a Bearded Dragon Cost? A bearded dragon, known as a “Pogona,” is one of the seven species in the lizard family. These lizards are known to live in semi-desert regions, commonly found in Australia. They tend to hang around on branches in the sunlight during morning and early afternoon hours, and over time, the bearded dragon has become a common domesticated animal that can be found both at zoos and inside homes. On average, a bearded dragon is going to cost anywhere from $45 to $125. These dragons can commonly be found through various reptile breeders and even your bigger name pet stores such as PetSmart. The cost of one is going to depend on the size, the type, age, breeder, quality and geographical location where you adopt one. If the dragon is a baby, usually less than a year, it will often be in the $30 to $60 range; however, if it’s more mature, the costs can be closer to $100. If the colors are rare, don’t be surprised if the costs are higher than $500. These costs, of course, won’t include the setup and recurring costs of taking care of one. Be sure to read our “extra costs” below to know what you should budget for when adopting one. To start out with all of the necessary supplies, the costs can get into the $400 to $650 range, depending on your preferences and what’s purchased. At a bare minimum, including the bearded dragon, plan on spending about $450. For example, PetSmart and Petco sell bearded dragons for about $30 to $80. Bearded dragons can come in all sorts of colors, sizes and breeds. The average adult measures up to 24 inches, half of which will be its tail. Common types on the market include the German Giant, Leatherback and Silkback. Colors often searched for include blue, black, citrus, orange, purple albino and white. Because of selective breeding, breeders are able to create a bearded dragon in virtually any color imaginable. Most breeders will include a health guarantee, guaranteeing a clean bill of health. Other breeders may include a small starter package that includes coupons, food samples and a care guide. These dragons have a lifespan of about 10 years. 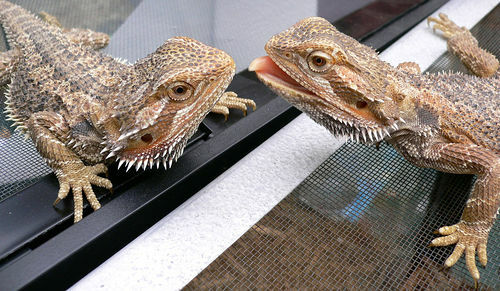 Bearded dragons can be purchased at local pet stores, such as Petco and PetSmart, as well as online via specialized reptile breeders. They can often be found on Craigslist when owners no longer want to take care of. While most tolerate handling, don’t be surprised if it hides in its habitat for most of the day or laying on a rock underneath the UV light. If you house more than one, keep the males separated as they tend to be very territorial. These dragons will be up to 50 percent larger than other species. These dragons can come in a variety of colors, and most breeders will create a unique color combination when breeding. The leatherback has a mutated gene while prevents the scales from growing to a full size, giving the appearance of “smaller” scales. Because of this, the skin will feel smoother and can help increase the vibrancy of the colors. Like the German Giant, they can also come in a variety of colors, but again, most breeders will mate to create unique color combinations. The silkback is created by mating two leatherback dragons, resulting in an even smoother appearance. Like the leatherback, the scales will be even smaller, almost to the point when you won’t even notice. Bearded dragons require a few different items for their tanks in order for them to live a long, sustainable life. For starters, these reptiles will require an aquarium that is larger than 50 gallons, and this sized aquarium can cost anywhere from $70 to $175, depending on the brand, what it’s made from and where you purchase it from. A lid screen may have to be purchased as well and can cost upwards of $30 to $50. Since they are accustomed to a desert setting, heat lamps will be required. A 60 to 100-watt bulb will be sufficient enough, and these lights will cost anywhere from $10 to $30 for the lights. The bulbs can start at $1 to $5 per bulb depending on the watts. It’s also best to purchase a thermometer to ensure that the temperature is at a comfortable setting. A good thermometer can cost $15 to $25 for two. Since these are cold-blooded animals, it’s essential their external body heat is above 85 degrees Fahrenheit at all times. The bearded dragon humidity should be closely watched as well and a hygrometer is highly recommended. Levels should be kept at 30 to 40 percent. If needed, an under tank heat pad may be required to supplement the heat. These pads can cost about $15 to $25, depending on the size. Rocks and sand, used as a substrate, will be necessary to ensure that it feels like the reptile’s habitat. This sand is relatively cheap and can start at $3 to $5 per 25-pound bag, while rocks can be a pinch more. Bearded dragon owners advise against sand since these reptiles can often swallow the sand while eating. Depending on your preferences, the tank should also be decorated with hiding boxes, a small water bowl and some driftwood for the dragon to lay out on while sunbaking. Again, depending on your preferences, this could range from as little as $10 to more than $100. Bearded dragons generally feed on live food such as crickets, superworms and mealworms. Plan on spending around $12 to $25 per week on food since the average dragon can eat up to 100 crickets in one week. Reptiles can also go on a veggie diet as well, which can be considerably cheaper at $4 to $9 a week. A vet will recommend a 70 percent insect and 30 percent vegetable diet. Every three months, it’s best to give your bearded dragon some calcium and mineral supplements. This supplement will be sprinkled on the food and will give the dragon the supplements it needs to survive. Like a cat or dog, unexpected vet bills may pop up from time to time. If taken to the vet, an exam alone could cost $60. Treating yellow fungus, for example, can cost about $200 for the checkup and the tests. Tail rot, another common surgery performed, can cost upwards of $600. Some people purchase a bearded dragon harness, which is similar to a dog harness, allowing you to let your reptile walk around. Keep in mind that each state has its own regulations and laws, so check with your local government to see if it’s legal to own this animal. A healthy bearded dragon will be active, alert, will have clear eyes, a full tail, healthy skin and will eat regularly. If you notice any weight loss, lethargy, bumps, sores, labored breathing or abnormal behavior, this could be a red flag and may need medical attention immediately. Common health problems include gastrointestinal disease, vitamin deficiency and respiratory disease. How fast do bearded dragons grow? Typically, they will grow about one inch per month in the first year of life and max out at 24 inches. Are bearded dragons smart? According to researchers at the University of Lincoln in the United Kingdom, they had found bearded dragons were able to open a wire door to gain access to food, even when untrained. The research had shown the dragons were capable of social learning. Check online through sites such as Craigslist. You may find someone trying to get rid of their pet, along with all of the supplies. This is a great way to purchase everything at once. Paid $65 at local Petsmart.